Submitted Photo Vicky and Neal Hatcher as they received the David Pollak Community Spirit Award. The Ohio River Valley Chapter of the American Red Cross has awarded Vicky and Neal Hatcher the David Pollak Community Spirit Award. The annual award is given to recognize an individual or company for their support of the Red Cross. In late June, the 110th American Red Cross Greater Cincinnati/Ohio River Valley Annual Meeting was held, where the Hatchers received their award. Both Vicky and Neal can trace their services to a young age. Neal’s mother and Vicky’s father both served on the board of the Ohio River Valley Chapter in Portsmouth for several years, and Vicky’s sister served on the board and was board chair for a number of years. Neal began donating blood to the Red Cross at age 17. Vicky taught lifesaving and swim classes, and has created very successful fundraising events since 1999. Vicky has also been instrumental in the recent successful fundraiser “Dancing With Our Stars.” The Third Annual Dancing with Our Stars for the American Red Cross was held Saturday, March 21, at the SOMC Friend’s Community Center with over 500 people in attendance. Neal Hatcher and Elizabeth Scott walked away with the Mirror Ball Fundraising Trophy. The event also raised $170,000 for the Ohio River Valley Chapter of the American Red Cross, which breaks previous records, and generated more than $97,000 to support the local Red Cross programs. 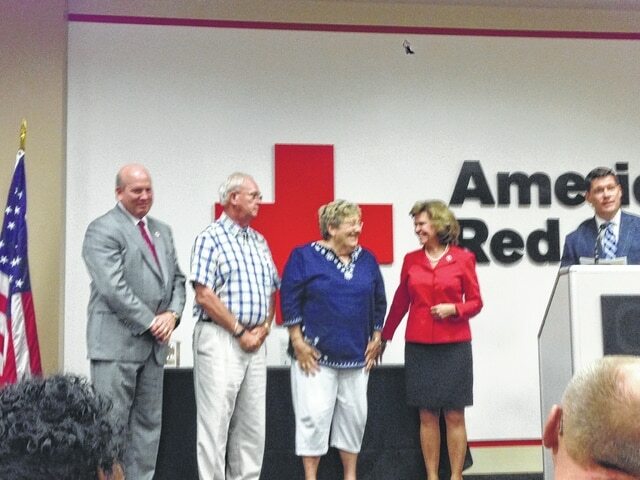 “Vicky and Neal thank you both for your long and dedicated service to the Red Cross, and our community. Congratulations on being recognized as the recipients of the David Pollak Community Spirit Award,” said Debbie Smith, community executive of the Ohio River Valley chapter of the American Red Cross. The Ohio River Valley Chapter of the American Red Cross is accepting nominations for its annual heroes breakfast. The annual event is held to celebrate those that go above and beyond the call of duty. The event is set to take place, Thursday, Aug. 13, at the Friend’s Community Center. The breakfast begins at 7:30 a.m. and concludes by 9:15 a.m. Proceeds from the event help support local disaster prevention, preparation and relief, the lifesaving training of first aid, CPR/AED classes, collection and testing of blood and blood products, support to military members serving around the globe, the transportation program, and international programs provided by the American Red Cross. Tickets for the annual event are $10 per person or $25 for patron seats. For more information about the Ohio River Valley Chapter of the American Red Cross, visit 1801 Robinson Ave. Portsmouth OH, call 740-354-3293, redcross.org or follow us on Twitter at @RedCross or on Facebook at Facebook.com/orvredcross.